Casserole cookery has been around since prehistoric times, when it was discovered that cooking food slowly in a tightly covered clay vessel softened fibrous meats and blended succulent juices...With the addition or subtractions of leftovers or inexpensive cuts of meat, the casserole is flexible and economical in terms of both ingredients and effort. The classic casserole, a French dish, was originally made with a mound of cooked rice. Fannie Merit Farmer's Boston Cooking School Cook Book (1896) had one casserole recipe, for Casserole of Rice and Meat, to be steamed for forty-five minutes and served with tomato sauce. In the twentieth century, casseroles took on a distinctive American identity. During the depression of the 1890s, the economic casserole provided a welcome way to stretch meat, fish, and poultry. Certain items were also scarce during World War I and leftovers were turned into casserole meals. The same was true during the Great Depression of the 1930s. 1912... There is no doubt that the fashion of cooking in casseroles or earthenware dishes has come to stay in this country; and it is hardly a matter of surprise when the advantages of this form of cookery are really understood, whether it be actual casserole cookery, so called, or cookery in fireproof utensils. Cooking "en casserole" is a term which signifies dishes cooked and served in the same earthenware pot or utensil, though, as every one knows, the original French word is the generic name for a stew pan or a saucepan. The old idea of a casserole was some preparation of chopped fish, or vegetables enveloped in a crust of cooked rice, macaroni, or potato. Properly speaking, however, a casserole is a dish, the material for which in many instances is first prepared in the saute or frying pan and then transferred to the earthenware pan to finish cooking by a long, slow process which develops the true flavors of the food being cooked. The sooner the casserole utensil becomes an indispensable part of our everyday kitchen outfit the better...When casserole cookery is thoroughly understood, many combinations of food and many inexpensive viands will be put to use and very palatable results obtained. Pork: Add enough olive oil to cover bottom of skillet and heat over medium high heat. Add ground pork, break meat up while cooking. Add onions, salt, pepper, Worcestershire sauce, liquid smoke and garlic powder. Mix together. Cook until pork no longer pink. Potatoes: Peel and slice potatoes 1/4 thick. Cook in boiling water for approx 15 minutes or until fork tender. Whip potatoes with electric mixer, mix until moderately smooth. Don’t over beat them, a few lumps are fine. Add 1/4 cup milk, 6 tablespoon butter, salt and pepper to taste. Whip until mixed. Adjust seasonings and milk, if desired. Spray a 9x9x2 inch pan, or any similar casserole dish. Add meat to casserole dish. Then add corn. Then add potatoes. Place the dish under preheated broiler, until heated through. Enjoy! Subscribe by email and never miss a post, it's free. Hi David, Shepherd's Pie was a family staple for me when I was growing up too. My mom also made it with beef. Ohh what a lovely recipe Christine!! I can only imagine how awesome it taste!!! Yummy! I like the idea of using ground pork. Most people use ground beef but do believe the correct way is with ground lamb. I always called the pie made with beef "Cottage Pie". But I think in home cooking there are as many recipes for a given dish as there are cooks.. Thank you so much for stopping by my cottage to have tea with me today and I wanted welcome you as a follower. Of course I had to stop by your Pantry to check out your Shepherd's Pie, which looks delicious. I am your newest follower and hope to see you again real soon! you have just remind me i have a while did not prepare shepherd's pie for my kids.Yours look yummy! This is the best.. love it..
Hi Mehjabeen Arif, welcome! We are happy to have you here. Hope you will come back to visit us. I did visit your blog. Nice blog. I'm now following you. looks so yummy! Thanks for following my blog and for your comments! I am following back! Hi Nikki, thanks so much! I like your blog. Oh my, this sounds so good..I make it, but not this way...Will have to try this recipe.. Thanks for stopping by my blog..
Hi Rosebud, I'm sure you will be happy with my recipe. Thanks for stopping by. Hey Christine... lovely blog... thanks for stopping by mine. History is new again in cooking... so says Slate magazine. I love knowing where things come from. The pie looks awfully good... it's a great combination of flavors with that pork... never tried it that way before!! Thanks for sharing the history of casserole, it's interesting. Shepherd pie is my daughter favourite dish and you've just reminded me that it's about time to spoil her with it again. Thanks for following me and I am your follower now. One of my good friend in Aussie also come from Texas too. She is currently having 5 wks holiday in the US. Lucky girl! Hi Lostpastremembered, I love food history. Thanks for stopping by. Hi Veronica, love food history, it's very interesting to me. Your friend is lucky to be in America for 5 weeks. Thanks for stopping by. What a great idea to include the liquid smoke! I have never made this before; it sounds great. Thanks for sharing your recipe. Hi Tiffany, I love liquid smoke, that stuff rocks. I always have liquid smoke in my pantry. Hi Kitchenarian, it is great. Very tasty and affordable. The food looks good but I also like the stories around the food. Hi Christine! I have heard this food many many times and my friend in UK makes this too. But I have never tried this food once! It looks delicious. Hopefully I can get to try. Hey Christine...Thx a ton for dropping by my space & now I came to know of ur wonderful space with mouthwatering recipes!!! I have alwayz been on the lookout for a simple sheperd`s pie & this is perfect..Thx a ton once again ;) Following u too!! Thanks for stopping by my blog and the comment. 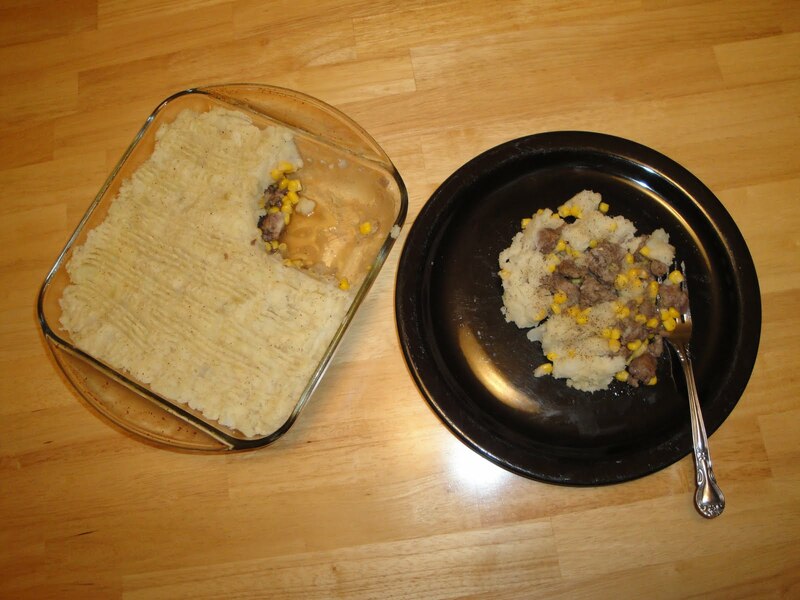 I'v never made Shepard's pie but sure love to eat it when other's have. I'm a new subscriber. Shepherd's pie is wonderful comfort food. Liquid smoke is a nice twist. Hi Kiran Bajaj Sawhney, thanks for stopping by. Yes, we can follow each other. Hi Lea Ann, thanks so much! I'll definitely try your version of shepherd's pie. To be honest, all the recipes I had before had their disadvantages. For some reason, my pie turned out too dry. Love Shepherd's Pie! We made one with venison too. Very interesting that you used pork. We must try one day!